In 1994, over 30 years after Lyndon Johnson assumed the Presidency and over 20 years after his death, the United States government began releasing tapes of his Presidential phone conversations. Among the first tapes released were those conversations he had just after the death of President John Kennedy. On April 15 of that year, Ted Koppel featured the tapes on his Nightline program. On it, he conducted a roundtable discussion with Johnson biographer Doris Kearns Goodwin and other Presidential historians and journalists. One of the most interesting tapes they listened to was a 20-minute conversation Johnson had with FBI Director J. Edgar Hoover on November 29, 1963, one week after Johnson became President. On the recording, Johnson and Hoover discuss their thoughts on the formation of a group to investigate the assassination — a committee that almost certainly became the Warren Commission. Then they turn their attention to the facts of the assassination itself, with Hoover updating Johnson with the latest information known by the FBI. Those facts, after only one week of investigation are very close to those we know about today, conspiracy theorists notwithstanding. They discuss Lee Harvey Oswald's activities the day of the assassination, including his capture in the theater. "There is no question Oswald is the man," says Hoover, "given the evidence we have." Johnson asks about any relationship between Oswald and Jack Ruby (Rubinstein). Hoover says they have discovered none. He explains Ruby was a "police character" who was well known by the authorities and speculates that is how he got into the prisoner transfer area. Hoover confides, "Dallas police didn't operate with the highest degree of efficiency." At the end of the conversation, Hoover recommends Johnson consider a bullet-proof car. Johnson replies, "I want to take every precaution I can... you're more than the head of the Federal Bureau as far as I'm concerned. You're my Brother and personal friend and you have been for 25 to 30 years." Upon hearing that last sentence, Koppel asked the panel, "What did President Johnson mean when he told Hoover, 'You're my Brother?'" Not a single panelist had any idea what Johnson was talking about. But we know, don't we? Lyndon B. Johnson is rarely included in lists of US Presidents who were Freemasons; however, he was, in fact, initiated an Entered Apprentice on October 30, 1937, in Johnson City Lodge #561, at Johnson City, Texas. He never went beyond the First Degree. J. Edgar Hoover, on the other hand, was a 33° Scottish Rite Mason, a York Rite Mason, a member of Federal Lodge #1, Washington, DC and a charter member of Justice Lodge #46 in Maryland. 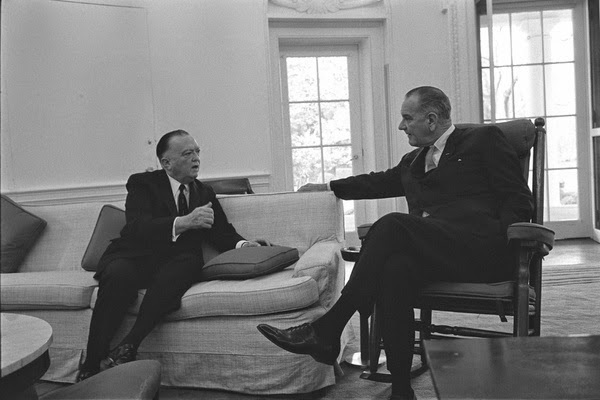 Lyndon B. Johnson and J. Edgar Hoover were Masonic Brothers; and President Johnson acknowledged it in that historic conversation. There was an article in Living Stones magazine this past October that asked a very interesting question. Have we cheapened our Fraternity? The article goes through an entire spiel of what initiation fees and dues cost in various lodges during different time periods. Right Worshipful Brother Yatim insists his article is not a call to increase dues. However, it is a call to brothers who are able to reach into their pockets and help provide more than what the dues are capable. I am in agreement with RW Brother Yatim that the Fraternity is much more than showing up and paying yearly dues at an ultra low price. 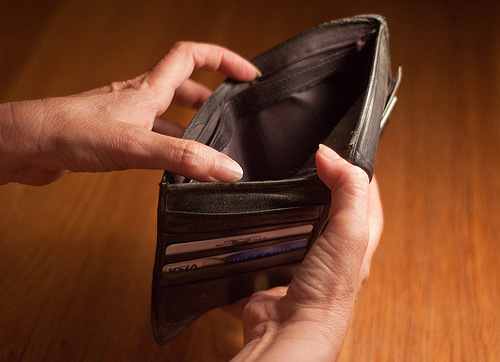 It is a requirement for a lodge to effectively manage their budget. I have even written about a lodge budget myself for the Midnight Freemasons. I however, cannot get over the fact that he seemingly attacked lodges that typically cater toward the Blue Collar workers. Most of these men show up to their lodges with out suit and tie. They have a suit and tie ready for the one instance they may use them in the year, however, the usual attire for a brother in these lodges are jeans and a button up. Honestly, some of these brothers show up in work clothes. He further asks if we are supposed to portray the “Cream of the Crop”, the first class citizens of our society are within this Fraternity, how would visitors or a potential candidate see our Fraternity with these individuals in the lodge? I believe the real question is: Are we making judgments on a brother who works hard all day, comes to lodge before seeing his family and dedicates the only time he has to the Craft; to better his community, his friends, family and himself? Have we really cheapened the Fraternity to the point of worrying more about the money than the cause? My brothers, Freemasonry is having a hard time finding the funds to support our many programs. It could be because our retention is low, our dues are lower than what our ancestors paid based of their salary, or, it could be because we continue to live in the glory days. Honestly, I believe it is a combination of it all. What should we do in order to fix it? Brothers, there are books upon books, articles and podcasts dedicated to fixing our problems as a Fraternity. Our problem is not JUST that we don’t charge enough, it’s not JUST our retention numbers, and it’s not JUST that we are living in the old days. Brothers, it is that we won’t do anything about it. Our Grand Lodges have pushed out plan after plan, strangling some jurisdictions control. Some Grand Lodges have issued a “Big Government” ideology that tells the lodge verbatim what they will and will not do. Is it a control thing? Is possible, but I don’t think it started out as such. I believe the Grand Lodges that are issuing out these laws, originally had no choice because our subordinate lodges failed to do what they were supposed to. Some were too lazy to keep up with their own bylaws, adopting the “Grand Lodge Basic”. I have even seen lodges give up their individual rights to vote in Grand Lodge to the Worshipful Master of the Lodge. It wasn’t because the Worshipful Master was the only vote that mattered in Grand Lodge, it was simply because the members of the Lodge didn’t want to stay in session to hear the issues being brought forth to Grand Lodge. It is not “at the will of the Worshipful Master”. The Worshipful Master’s vote represents the majority of his Lodge. Brothers, we can point the finger and say what and who is to blame, but that will never solve the issue. It has been expressed and debated multiple times in various forums the reasons we are in this predicament of decline. It is time to stop talking about it, and do something about it. 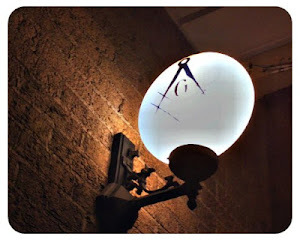 In my presentation “Man in the Mirror” I ask the commonly referred joke “How many Master Masons does it take to change a light bulb?” Usually you hear the answers from the crowd, “Three” or “I don’t know…” It’s not a trick question. The answer is One. All it takes is a Master Mason to see the problem, address it and fix it. It all starts with that man in the mirror, The Change you want to see. Allow the individual Lodges to determine what is best for their lodge and community. If it means the lodge turns to Tuxedos and higher dues, as long as it works for that lodge to stay alive. If the lodge is mostly blue collar, there is nothing wrong with a brother wearing jeans and a polo to regular scheduled meetings. We are the cream of the crop, brethren. It isn’t about how we look on the outside, but how we conduct business on the inside. From the inside we can change our image, which will change the world. We, my brethren, are the ones that must step up and say what is right for our lodge. With our participation and discussion with each other inside lodge, we can determine what is right, what is wrong, what works and what doesn’t. Once we do that, retention will not be the issue, appearance will not be the issue, the dues will not be the issue and we will soon realize the glory days are not behind us, but, right in front. Bro. Aaron Gardner, an American Soldier who just recently transitioned into the Reserves after 8 years serving the Active Duty Army. He dedicates the majority of his free time to Freemasonry with his constant studies, writing and traveling from lodge to lodge to learn as much as he can regarding Freemasonry. He likes to relate his everyday life to the Craft and anything he finds he wants to spread to the world. It is his passion to study people, religion, history and Freemasonry. When he isn't working as a Soldier he is dedicating his time to the amazing and supportive Emily, writing about Freemasonry and writing his very own novel. His blog page is Celestial Brotherhood. So, why join the Order of the Eastern Star? I cannot tell you how many times I hear this question. The funny part for me is the excuses, but that is because not only am I educated with OES, I am a member. Though if someone told you they did not want to join because their wife does not want to join, your first thought would be the same as mine, “I am Sorry Brother/Companion Master Mason, it is a shame that your wife does not want to join OES.” Now I am not a Mason that has looked to join the lateral degrees, I am not a Squire in the York Rite nor am I a Kilt Maker Monk in Scottish Rite, or whatever, but I am a member (and currently the Associate Patron) of Millburn Chapter #570 of the Order of the Eastern Star, so let me talk about what I know. Ok so obvious answer to the burning question, why I have I not “furthered” my learning in Masonry by joining one of the “Rite’s”? The answer is two (actually three) parts. First, I believe that the highest degree one can achieve is the 3rd Degree. Second, I believe that there is much wisdom in the Blue Lodge, so much so that I am committed to learn everything I can before expanding my knowledge. Of course lastly, I promised some very wise Brethren I would not rush into anything, but take my time at each pass. So the next obvious question is, why would I have all those reasons but still join the Order of the Eastern Star, and this one is an easy answer, because I took an Oath, as all other Brethren did, and this fulfills my Oath. Now, the Order of the Eastern Star was founded in the mid 1800’s, and its actual reason for existing is, much like Freemasonry, shrouded in secrecy. Some believe that it was the first attempt for the French Freemasons of the time to have a Female Freemasonry or Androgynous Degrees, for men and woman to be able to have some ritual. This is my theory, and I am not the most intelligent guy, just ask my wife, but here it is nonetheless. I believe that the Order of the Eastern Star was created, using the evidence that for one to join they either need to be a Master Mason, or the female relative, or step relative, of a Master Mason. So logically, don’t tell my wife I said that, she won’t stop laughing, we can conclude that the reason for the existence of the Order of the Eastern Star is to have all the female relatives in an organization where, if God forbid, anything happened to our Brother, we would have the family where we could still talk with them. Thus, fulfilling our Oaths, as well as a deeper bond with our Brothers as well. Now, what if your wife, daughter, sister, etc…does not want to join OES? Easy. Join and support them anyway. You see, it is not just for your family, it is for everyone else’s. Plus let’s be honest, you do not know about it enough to tell them about it. It is true though, that if you were doing something, even partially Masonic, that your lady would probably get serious enough to join. It would help the rest of us to get to know your family, and become part of their family as well. What is more worth while than our families as well as them being connected to our Oaths? Do we not have time? I know that my Chapter only meets once a month. Is it the monetary value and lack of funds? I only pay a $15 dues fee. Is it the fact that your significant other does not join? I already answered this one. In fact, I have a few reasons outside of all this that might change your mind, actually just one really important part. Most of these women love to cook and bake, top that with the grilling and cooking sensations that we as Masons have, and BOOM! Seriously though, if you put on another endeavor besides your Blue Lodge, I recommend you look into joining the Order of the Eastern Star before any other. If we don’t support them, how can they grow? How can we say that we lived our Oaths fully? How can anything else be more important than the small amount of time this will take? One of the episodes in the Our Gang series tells the tale of the young cowlick-bedecked Alfalfa attempting to shed his reputation as a common crooner and become a great opera star. He visits an opera company where the impresario is so inspired he immediately signs Alfalfa to a contract effective 20 years hence. At the appointed time two decades later, the intrepid divo makes his operatic debut and the audience, predictably, boos him off the stage. It's all downhill from there for our hero, whose adult life just doesn't turn out the way he expected. The episode ends happily as Alfalfa wakes from his dream, sees the error of his ways and returns to his calling as a popular, albeit off-key, crooner. 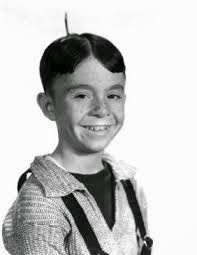 In many ways the episode is a foreshadowing of the real life of the actor, Carl "Alfalfa" Switzer, whose meteoric rise to fame as a child preceded a tragic adulthood. Hal Roach created the Our Gang comedies in 1921 after watching a group of kids do what kids do best. They were playing in his yard. Originally made as silent films the series grew in popularity as Roach added sound in the 1930s. MGM re-released the episodes in the mid 1950s as The Little Rascals. In 1935, Carl's parents took him and his older brother Harold to visit the Hal Roach Studios in Los Angeles. The purpose of the trip was nothing less than to turn Carl and Harold into child stars; and it worked. Carl and Harold parked themselves in front of the crowd at the studio's café and began performing. Roach saw them and signed them on the spot. Carl... Alfalfa, as he was known in the series... quickly overshadowed Harold and became one of the top stars along with regulars Darla Hood and George "Spanky" McFarland. He was enormously popular with viewers but was just as unpopular with the child actors and filming crew. Alfalfa was a prankster and the biggest bully of the gang. During filming he would intentionally step on other kids feet or stick them with a nail he carried in his pocket. On one occasion a cameraman became frustrated with Carl as he muffed his lines and told him to, "get it right so we can go to lunch." After the cameraman left, Alfalfa gave each of the kids a stick of gum and collected it back from them after they were done chewing it. Then he took the enormous wad and stuck it into the gears of the camera. That afternoon, the kids went home while the cameraman tried to save his machine. One day director George Sidney became so frustrated with Alfalfa's antics he pulled him aside and told him, "Come and see me when you grow up so I can beat the crap out of you." In 1940, Roach booted 13-year old Alfalfa from the series for being too old. He had been earning about $750 a week — a fortune in the depression era — and supporting his family. Suddenly it all ended and, like most child stars, he did not make a successful transition into acting as an adult. While continuing to struggle in his acting career, he became an outdoorsman and hunting guide. In 1958, he borrowed a hunting dog from a man named Bud Stiltz. He lost the dog when it ran after a bear on a hunting trip, and he offered a reward for the dog's return. When a man brought the dog back to him, Alfalfa was so grateful he paid the reward and bought the man several drinks. Later, he decided Stiltz should be responsible for the money he spent on the dog's return. On January 21, 1959, Carl went to him and demanded $50. Stiltz refused to pay. They argued and fought. Finally, Alfalfa drew a knife and went after him. Stiltz ran, got a gun and killed the 31-year old former child star. A jury subsequently acquitted Stiltz of any wrongdoing. Along the way, there was a bright spot in Carl's short and tragic life. In his work as a hunting guide, he crossed paths with cowboy superstar Roy Rogers, a 33° Mason and member of Hollywood Lodge 355. Roy tried to help Carl's faltering career by giving him parts in several of his shows. He also encouraged Carl to join the Freemasons, which he did. Brother Carl was buried in Hollywood Forever cemetery, a resting place for many of Hollywood's greatest. 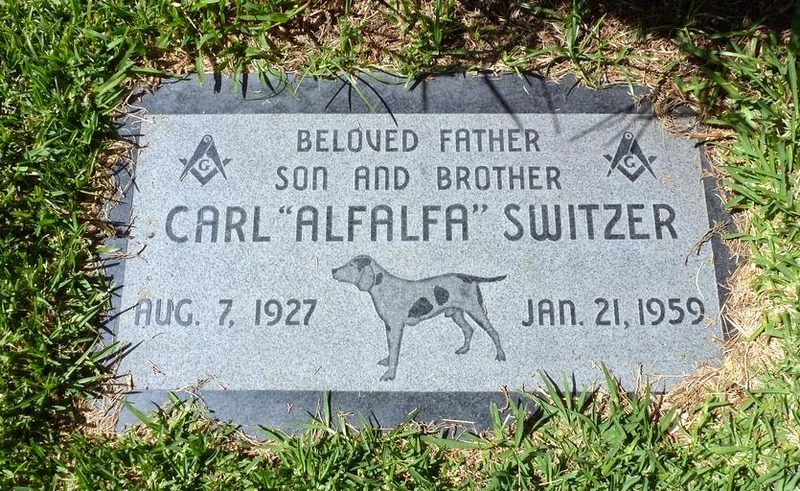 His tombstone bears symbols of the better parts of his otherwise tough life: It reads "Carl 'Alfalfa' Switzer" and is adorned by a carving of a hunting dog (not "Pete" from the Our Gang series, as some think), and two square and compasses flank the top. Interestingly, the cemetery sits on the grounds of what once was Southland Lodge 617, and the original Lodge building is still standing. Alfalfa and other child actors from the series proved being a child star wasn't as glamorous as it might have seemed. About half of them, Carl included, did not live to see 40. Even Carl's brother Harold committed suicide at age 42. Today, the Little Rascals are all gone; every one of them. Many, Carl chief among them, never had that second chance Alfalfa got when he woke from his operatic nightmare. Since I was a small boy I have been listening to old time radio shows. My parents, who had me later in their lives, grew up during the Great Depression. They would run home from school in the afternoon and after their chores were done would gather around the family radio and listen to the radio shows that magically came through the air into that small speaker on a radio that was then more like furniture than the radios we know of today. Mom and Dad would mention listening to radio shows like “Inner Sanctum” with the creaking door sound effect at the beginning or comedies like “Lum and Abner” and “Fibber McGee and Molly”. They would often laugh recalling their favorite moments of these old shows. Each of them even told of their memories going back to that faithful Sunday morning in December in 1941 when the world first heard about the attack on Pearl Harbor. They told about the grim looks on their parents faces as they gathered around that radio. One day my parents came upon several cassettes of these old shows for sale in the gift shop of the Auburn, Cord, Duesenberg Museum they took us to in a town near where I grew up. I recall their excitement and bought several of them. On the way home Dad popped one into the cassette deck of our new Ford Pinto. Having a cassette deck in a car with stereo speakers was a big deal in those days. On the way home we listened to several episodes of these great shows. I was hooked. For most of us that grew up in the age of television the idea of listening to a story instead of watching it unfold before us on a screen is a bit strange but radio, in my opinion, expands your mind. Instead of passively watching a show you must concentrate on the story being told by the actors. You also create the pictures you are listening to in your mind. It's like a play being performed inside your head and your mind provides the stage. Over the years I have enjoyed listening to many of these old shows. They take me back to a time I have always loved but wasn't privileged enough to live through. I have owned many cassettes of these shows over the years. Over time the cassettes were upgraded to CDs and now to digital files. I have even discovered several apps for my iPhone in which I can listen to the shows. The delivery might be different but the ageless writing of those shows and the performances by great actors assisted by sound effects still sound as classic and timeless as they were when they were produced. Several months ago Brother Robert Johnson played an episode of one of these old shows entitled “Quiet Please” recorded in 1948 on his Masonic podcast “Whence came you?” the show was filled with lots of Masonic symbolism and this episode of Quiet Please even shared the name of Robert's podcast. Like many of Robert's listeners I listened to the segments of the show over the next couple of weeks. It was great fun listening while I sat at the dog park watching my dog Happy run and play. About a month ago I got a call from Robert one afternoon. I could tell by the sound of his voice he was excited. Robert explained that several Brothers loved that episode of Quiet Please so much they wanted more. He wanted to produce a Masonic Radio podcast that sounded like an old time radio show from the 1930's. It would have sound effects and be recorded in such a way that it would sound authentic to the era. The show would even have real commercials for real Masonic products recorded like it was part of the original show. Robert told me “I think with your ability to write Masonic fiction you would be perfect to write the script.” I told him I would write it but in my head I wasn't sure if I could pull it off. How could I write something that even came close to the quality of one of those old programs? I thought the first step would be come up with a name for the show. I thought “Masonic Radio Theatre” sounded like it would have come from that era. Although it was a bit generic it would make a great working title. Luckily a thought for the story came into my head and I produced a rough draft, about halfway completed, and emailed to Robert. He loved it so much he started casting the parts and it was announced on several Masonic news outlets. I knew I had better finish it. I also created a Facebook page for the project. During the golden age of radio a script would be written and performed by actors, usually in front of a live audience either broadcast live or “transcribed” onto a 16 rpm long play record and played later at a local radio station. Many of the surviving radio shows we still enjoy today come from these records. 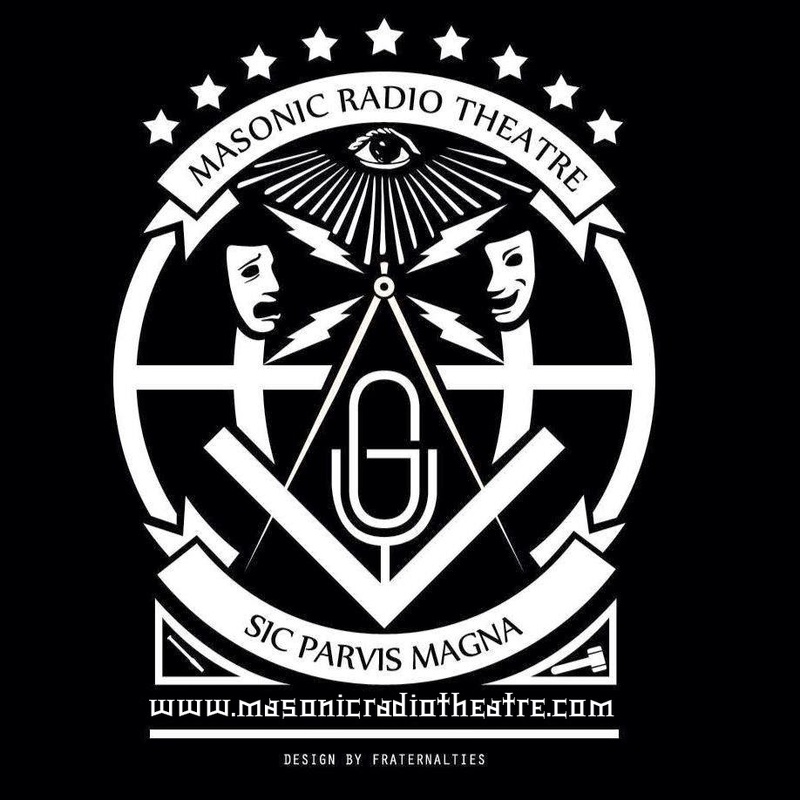 The production of the episodes of the Masonic Radio Theatre would boggle the minds of the makers of the golden age radio programs. Our first episode, The Craftsman, was written by me here in Texas. The finished script was sent via email to Robert in Chicago who distributed it to the various players. Each player recorded their various parts on their personal computers, without hearing the dialogue of the others and emailed the voice files back to Robert from Illinois, the files came from; Texas, Minnesota, Michigan, Virginia and various other places. Robert mixes them all together, along with the music and sound effects. After what seemed like an eternity I woke up one morning and over night Robert had emailed the finished product to me. I quickly downloaded it to my phone and I listened to the episode while I was in the car. I must have had a smile on my face while I was driving down the road. I don't want people to think I'm bragging but I was blown away with what we had created. I couldn't believe how well the show turned out! Later that day we posted the show on iTunes for the general public. I was honestly taken aback by the reception the project has received by the public. The Facebook started receiving hundreds of “likes”. Brother John Paul Gomez of Fraternal ties created a beautiful logo for the project. The response to the project has taken on a life of it's own. Since the release of “The Craftsman” production has been started on several more episodes. Including our next episode “A new lodge is born” a radio adaptation of one of the “Old Tyler Talks” by Brother Claude Claudy. I think it should be a great success. I want to personally thank all of our fans and supporters and all the actors who helped make this happen! Lodges are interesting things. They can do anything or they can do nothing. It is upon the members to proactively and willfully engage in activities to better the communities in which the lodge resides. I have heard it said that Monday Night Football (or more generally, television) killed the Lodge. I know of folks who, during football season, are never found in lodge. Even in the age of Tivo, watching a game live is somehow more important than Lodge. I can't hold it against them, as it is upon each person to place the importance of Lodge in their own lives. We might each have our opinions, and may be able to justify them well, but in the end it is upon each person to make their own choices. But I provide a different angle. While we might, all too often, get upset or annoyed with people who place television on a higher level than attending Lodge and engaging with the brethren. Perhaps it isn't as much their fault as we might think. Sure, they could assign more value to Freemasonry to the point that they show up and record the game (Though not a sports fan, that's what I do to shows I enjoy that come on Monday evenings). However, what are we, as a lodge, providing to gain and hold that value judgment? Who are we to offer a dwindling and degraded product and demand they prefer it because of some things said in a ritual years or decades ago? Lodges have largely gone from being a vital and integral part of the community, with great and important fellowship, to arguing about bills twice a month after eating a rather dull thrown-together-at-the-last-moment meal (In fairness, the brother who cooks at my lodge does a wonderful job, probably the best I eat all week). My point is, who are we to complain about a lack of attendance when what we provide is of immensely little value? We are to build one another up and give support while we develop ourselves into what God wants us to be, yet too often we complain about what to do with money and shoot down any ideas that involve helping in the community, bowing before the stereotypical cranky past master. It is one thing to complain about problems, but another to provide a solution. Put another way: Simple people whine, leaders solve. Here is my solution: Be the fix. In the cartoon-movie Robots, a common theme was “See a need, fill a need.” Be the solution to the problems you find. Are people not coming to your lodge? Engage them directly, but not in an accusatory way, to find out why. What is missing from the Lodge experience that they sought? What would it take for them to come back? Then, when you have compiled your list of what is missing (I would wager you find the same 5-10 items repeated), find a way to make them happen. Then make sure these brothers know that it is happening. At that point, if they return you have made a great work better. If they do not, then they were being dishonest and their lack of involvement is upon them, not you. You won't help everyone, but that is never cause to not help anyone. 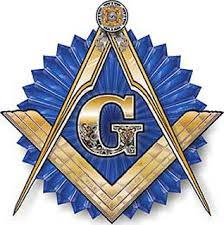 Brother Tech is the author of A Christian's Perspective on Masonic Symbols: The Square and Compasses. He is an active member in the craft, loves motorcycles and prefers to remain anonymous. Many of the things that Benjamin Franklin dabbled in during his lifetime weren't known until many years after his death. One of these interesting exercises he undertook was writing a new and more concise version of the Lord's Prayer. This unusual manuscript was found by Jared Sparks as he putting some of Franklin's papers in order so they could be published, and it was originally published his book Works of Benjamin Franklin in 1847. "Heavenly Father, may all revere thee, and become thy dutiful Children and faithful Subjects; may thy Laws be obeyed on Earth as perfectly as they are in Heaven: Provide for us this Day as thou hast hitherto daily done: Forgive us our Trespasses, and enable us likewise to forgive those that offend us. Keep us out of Temptation, and deliver us from Evil." New Version: Heavenly Father, is more concise, equally expressive, and better modern English. Old Version: Hallowed be thy Name. This seems to relate to an Observance among the Jews not to pronounce the proper or peculiar Name of God, they deeming it a Profanation so to do. We have in our Language noproper Name for God; the Word God being a common or general Name, expressing all chief Objects of Worship, true or false. The Word hallowed is almost obsolete: People now have but an imperfect Conception of the Meaning of the Petition. It is therefore proposed to change the Expression. New Version: May all revere thee. Old Version. Thy Kingdom come. This Petition seems suited to the then Condition of the Jewish Nation. Originally their State was a Theocracy: God was their King. Dissatisfied with that kind of Government, they desired a visible earthly King in the manner of the Nations round them. They had such King's accordingly; but their Happiness was not increas'd by the Change, and they had reason to wish and pray for a Return of the Theocracy, or Government of God. Christians in these Times have other Ideas when they speak of the Kingdom of God, such as are perhaps more adequately express'd by New Verson: And become thy dutiful Children and faithful Subjects. Old Version: Thy Will be done on Earth as it is in Heaven More explicitly, New Version: May thy Laws be obeyed on Earth as perfectly as they are in Heaven. Old Version: Give us this Day our daily Bread. Give us what is ours, seems to put in a Claim of Right, and to contain too little of the grateful Acknowledgment and Sense of Dependance that becomes Creatures who live on the daily Bounty of their Creator. Therefore it is changed to New Version: Provide for us this Day, as thou hast hitherto daily done. Old Version: Forgive us our Debts as we forgive our Debtors. Matthew. Forgive us our Sins, for we also forgive every one that is indebted to us. Luke. Offerings were due to God on many Occasions by the Jewish Law, which when People could not pay, or had forgotten as Debtors are apt to do, it was proper to pray that those Debts might be forgiven. Our Liturgy uses neither the Debtors of Matthew, nor the indebted of Luke, but instead of them speaks of those that trespass against us. Perhaps the Considering it as a Christian Duty to forgive Debtors, was by the Compilers thought an inconvenient Idea in a trading Nation. There seems however something presumptious in this Mode of Expression, which has the Air of proposing ourselves as an Example of Goodness fit for God to imitate. We hope you will at least be as good as we are; you see we forgive one another, and therefore we pray that you would forgive us. Some have considered it in another Sense, Forgive us as we forgive others; i.e. If we do not forgive others we pray that thou wouldst not forgive us. But this being a kind of conditional Imprecation against ourselves, seems improper in such a Prayer; and therefore it may be better to say humbly and modestly New Version: Forgive us our Trespasses, and enable us likewise to forgive those that offend us. This instead of assuming that we have already in and of ourselves the Grace of Forgiveness, acknowledges our Dependance on God, the Fountain of Mercy, for any Share we may have of it, praying that he would communicate of it to us. Old Version: And lead us not into Temptation. The Jews had a Notion, that God sometimes tempted, or directed or permitted the Tempting of People. Thus it was said he tempted Pharaoh; directed Satan to tempt Job; and a false Prophet to tempt Ahab, &c. Under this Persuasion it was natural for them to pray that he would not put them to such severe Trials. We now suppose that Temptation, so far as it is supernatural, comes from the Devil only; and this Petition continued, conveys a Suspicion which in our present Conceptions seems unworthy of God, Therefore might be altered to New Version: Keep us out of Temptation." Nobody really knows what Franklin's motives were in writing this manuscript--perhaps it was merely to entertain himself. 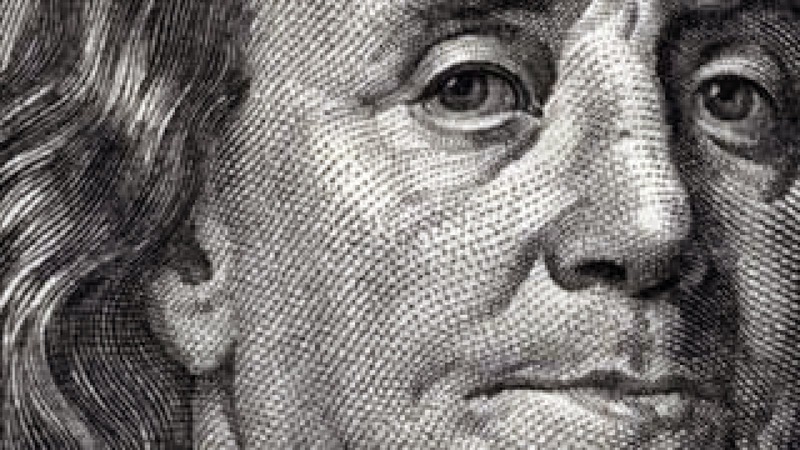 There will be those that will dislike the idea that Franklin even considered altering such an important and revered part of the New Testament. 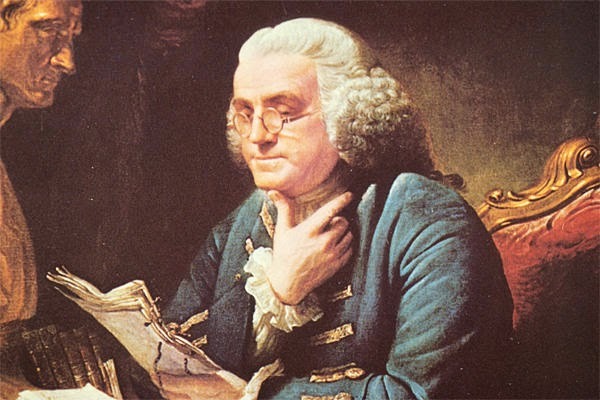 But there will be others that will respect the fact that Franklin obviously had a deep reverence for the Holy Bible, and an extraordinary understanding of Theology to even undertake such an exercise and justify the changes he made. It's just another example of the remarkable and diverse mind of one of America's most celebrated Founding Fathers. One of the most exciting developments in Freemasonry of late is the growing amount of lodges, research societies and others that are hosting a Masonic Symposium. But what exactly is a Masonic Symposium? I was privileged to recently attend a symposium hosted jointly by The Masonic Society and The Philalethes Society. The event was held at the Valley of Chicago Scottish Rite Cathedral in Bloomingdale, Illinois. An all-star line-up of presenters was on tap for the day. Leading off was The Midnight Freemasons very own WB Steve Harrison who gave an amazing talk on “The Mystery of Oak Island: Masonic Connections to a Real National Treasure Site”. Brother Harrison was followed by WB Shawn Eyer whose presentation was entitled “The Role of Song and Music in Traditional Freemasonry”. Many of you know may know Brother Eyer with his role as Director of Communications at the George Washington Masonic National Memorial and as Editor of The Philalethes Journal. Returning after lunch, WB Mark Robbins gave his talk, “Freemasonry and Law Enforcement: Compatible or Conflicting?” that delved into some of the laws that have been passed over the years in the United Kingdom, trying to force members of the judiciary and law enforcement to register if they were Freemasons. 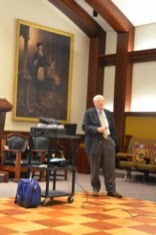 Next was WB Alton Rountree, who is Editor of The Phylaxis Society magazine. Brother Rountree focused his remarks on how to conduct quality masonic research “Masonic Historical Research and Presentation: Intricate and Acceptance”. We finished up the evening with a fine dinner and an excellent presentation by WB Andrew Hammer, whose talk “Observing the Craft: The pursuit of excellence in Masonic Labour and Observance”, who has also published a very popular book by the same title. I believe it is extremely encouraging to see so many of these events popping up across the country. It is starting resurgence of interest in masonic research. Has your lodge considered hosting such an event? You could start simple, by even having just one speaker. Masonic education should be a part of every lodge meeting, even if it is simple as reading the Masonic Short Talk Bulletin that is sent to every lodge by the Masonic Service Association. 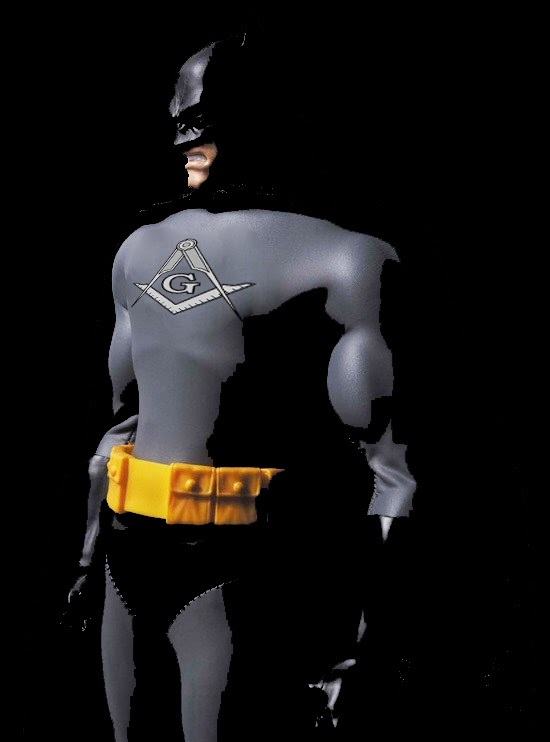 Who knows, perhaps sometime you will see “The Midnight Freemasons Symposium” coming to a town near you. I am not a very social creature. I am an introvert, a self-described hermit. I work, I go to Lodge, I take care of family and I ride my motorcycle (with the VAST majority of my miles being alone, how I tend to prefer). I have never been a person for parties or group outings, instead preferring a few close friends or just time alone to recharge. If I had my way, a cave with a refrigerator and wifi would be my ideal. However, life is not about me, it is about He who sent me and His plans for my life. And so it is with you. Man is, by nature, an egocentric creature. We start out in life with ourselves as our only focus. This can be justified, perhaps, by our total dependence on another for all aspects of our life. What other recourse do we have but to be focused on ourselves when we are so incapable of providing for ourselves? On a physiological level, a newborn is mentally unprepared to have a concept outside of their perspective. As we develop, we begin to first understand that objects can exist outside of our direct sight. Later we learn that sounds associate with thoughts and these objects gain names. As we grow further, we begin to learn about intangible concepts. In adulthood, we learn what abstract concepts like justice and love truly mean. As we grow to completion, in terms of our mental development anyway, we ought to find ourselves letting go of the egocentric creature within us. Instead, however, we find ourselves clinging to that same self-centered perspective. As I look at the rough ashlar, I see the self – the ego-driven and selfish man. It is not rough and irregularly shaped because there was no plan for its development. The Creator's plan was evident and in existence long before every stone was formed. It is rough and irregularly shaped because of Ego. The egocentric nature in us wants to shape our lives by what gives us pleasure, or what we want in that moment. Every moment of our lives, we work on our ashlar. We build and shape ourselves into what we will eventually become. When we are our own guide, we will never find ourselves matching the true plan and purpose for us. It is only when we let go of the self, and put God in charge in our lives, that we begin to shape ourselves by God's plan. By that Holy Plan, we become part of something larger than ourselves, and fit that role perfectly. That is our Perfect Ashlar. Every day, the boy’s boss, the local locksmith, went to get a few beers over the lunch hour. Most days, he didn’t leave the boy alone with a hulking, surly giant, but one day he did. There was no question that the boy was afraid. The man was the ugliest, most terrifying looking character the boy had ever seen, with a bristly beard, a mean disposition, and an jagged scar that ran down the side of his face. And this man—a criminal and prisoner—was wearing heavy handcuffs. The sheriff had brought his prisoner, handcuffs and all, into the shop because he’d broken his key off in the lock, and there was no way to get the handcuffs off. Because the sheriff and his prisoner had arrived near the lunch hour, the locksmith instructed the boy to get a hacksaw and cut the handcuffs off while he and the sheriff went out for a drink. The boy frantically sawed away at the hardened metal cuffs, breaking several saw blades in the process. The last broken blade had very nearly cut the man’s hand, earning the boy a sharp, ominous threat from the man. In nearly an hour, the boy hadn’t made even a dent in the cuffs, and his boss was due back in a few minutes. The boy didn’t like the idea of setting this man loose in a store that sold, among other things, pistols and derringers, but times were hard then. He was lucky to have a job, and his desire to please his employer was stronger than his fear of the man. There had been a good reason his father had arranged the apprenticeship for the boy with the locksmith and a good reason the locksmith had taken the boy on—he was good with locks. As a youngster, he used to lock and unlock all the cabinets and cupboards in his house using a small common tool—a buttonhook. In fact, he was notorious for being the little boy who’d unlocked the doors of all the shops in his hometown one evening. That day when he failed to saw off the handcuffs, he decided that if he couldn’t defeat the cuffs by hacking them off, maybe he could pick the locks. That was not what his employer had asked him to do, but it was the only alternative he knew. He clipped off a piece of piano wire and fashioned it into an appropriately sized tool. Then he paused. The last thing he wanted was for this criminal to see what he was about to do. “Do you mind looking the other way?” he asked gently. “Like hell I can,” the man responded. After the boy worked on the first cuff for about a minute, it suddenly clicked open. It took him half that time to open the second cuff. The locksmith and the sheriff returned just as he was finishing. The prisoner was still sitting there, stunned at what the boy had done. He picked up the cuffs and looked them over carefully. When the locksmith suddenly realized the boy hadn’t cut the cuffs off, he took them from the giant and looked at them in amazement. Ehrich would go on to become a great locksmith, the best the world has ever seen. There wasn’t any kind of lock that he couldn’t defeat, but he specialized in handcuffs. He opened locks and handcuffs all over the world. He escaped from many unusual situations—he was locked in prison cells, mailbags, straight-jackets, and coffins. He could even escape being locked in a large milk can filled to the top with water. And nobody ever knew his secret. That boy would grow into the man known the world over by a single name—Houdini. Ehrich Weisz was born on March 24, 1874, in Budapest, Hungary, to Rabbi Mayer Samuel Weisz and Cecilia Steiner Weisz. Hoping to secure a better life for his family, Mayer immigrated to America and changed his last name to Weiss. At age twelve, Ehrich ran away from home, hopping a freight car to Kansas City. A year later, he re-joined his family, who were by then living in New York City but still struggling to survive. In New York, Ehrich and his younger brother, Theo, began to pursue their interest in magic. Ehrich’s idol was the great French magician Robert Houdin. When Ehrich started performing magic, he added an “i” to the end and began billing himself as “Houdini.” He undoubtedly got the “Harry” because it sounded much like his childhood nickname Ehrie. Harry Houdini began his professional career at age seventeen, doing magic shows in music halls, at sideshows, and at the amusement park on New York’s Coney Island. It wasn’t unusual for him to perform twenty shows each day. For a short time, he worked with Theo, billed as the Houdini Brothers. But when Harry met Beatrice “Bess” Raymond, a teenager who was also attempting a career in show business, she joined the act as Harry’s new partner, and Theo started a solo career as a magician under the name “Hardeen.” Harry and Bess married in 1894, remaining devoted companions and partners for the rest of their lives. In 1895, the Houdinis joined the Welsh Brothers Circus. Harry did magic while Bess sang and danced. Together they performed a trick called “Metamorphosis,” where Harry and Bess switched places in a locked trunk. Harry wasn’t satisfied with his small act. He continued to work on new tricks and to develop his showmanship. He also became an expert at escaping handcuffs. Arriving in a new town, Houdini would claim he could escape from any handcuffs the local police had—and he did. These publicity stunts were excellent advertising for his shows. Houdini offered $100 to anyone who could provide handcuffs he couldn’t get out of, but he never had to pay that reward. 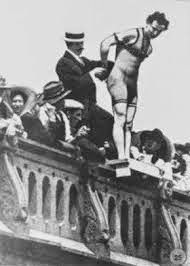 As his name and reputation spread, Houdini decided to take his show on the road to Europe. In 1900, Harry and Bess sailed to England with no bookings and only enough money to survive a week, but Houdini was able to get an engagement at a London theater. After one particularly successful stunt, he found himself booked solid. Sold-out shows followed all over Europe. Wherever he went, he repeated the stunt. He called upon local police to restrain him in any way they could think up, but he escaped from all of them. By the time Houdini returned to the United States in 1905, he was an international celebrity. Among the stunts performed in America were escaping from prison cells, squirming from straitjackets while suspended upside-down, and jumping into rivers from bridges while chained and handcuffed. His death-defying stunts and showmanship also extended to his famous milk can escape. Houdini was cuffed and shackled, lowered into an oversized milk can that was filled to overflowing with water, and then hidden by a curtain. Before he submerged himself and the can was sealed, he would ask the audience members to take a deep breath and hold it as long as they could. As the members of the audience, red-faced, could hold their breath no longer, they realized that if they were in the milk can, they would be drowning, and yet Houdini remained trapped. Hidden behind his curtain, Houdini was able to escape in three minutes, but he frequently stayed behind the curtain for much longer to make his re-appearance all the more dramatic. Harry and Bess lived in a large house they purchased in New York when they weren’t traveling. They never had children, but Harry’s mother lived with them until she died in 1913. Her death was the greatest tragedy of his life. For weeks afterward, he made almost daily visits to the cemetery. He said in a speech to the Magician’s Club, “It seemed the end of the world when she was taken from me.” Eventually, Houdini was able to return to work, but he continued to mourn his mother for the rest of his life. Partly as a result of his mother’s death, Houdini renewed an early interest in spiritualism, the ability to communicate with the dead. Houdini wanted to believe that such communication was possible, but after many years of tricking people, he knew a trick when he saw one. He went on a crusade against phony spiritualists. He felt they were profiting by preying on people who, in their mourning, wished for nothing more than to talk again with their departed relatives. He often passed up better-paying opportunities to lecture on the subject, and he unmasked many frauds in the cities he visited. 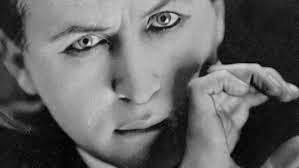 In his own act, Houdini often recreated many of the tricks the charlatans used to trick people at a séance into believing they were making contact with spirits from beyond the grave. Houdini had a standing offer of $10,000 to anyone who could produce a result in a séance that he couldn’t reproduce himself using magic and trickery. No one ever collected that reward either. Houdini did believe contact with the dead was possible, but he didn’t believe that most of the mediums claiming to be able to make that contact were legitimate. Because of his interest in spiritualism, Houdini developed a close friendship with the creator of Sherlock Holmes, author Sir Arthur Conan Doyle, who was a true believer in spiritualism. In fact, Doyle was convinced that Houdini employed psychic powers to perform his remarkable escapes. Houdini denied that he had such powers. He even tried to explain to Doyle how he actually did some of the things he was able to do, but Doyle didn’t believe him. Eventually, this rift over spiritualism and psychic ability ended their friendship. When America entered the First World War, Houdini attempted to enlist in the army, but at forty-three, he was rejected as being too old. Unable to fight, Houdini found other ways to serve. He entertained the troops by performing free shows and organized Liberty Bond shows to help finance the war. In the fall of 1926, Houdini put together a new show and took it on the road. It was an elaborate, two-and-a-half-hour show that required Houdini to be on stage almost the entire time. The highlight of the show was the Chinese water torture escape, which had become one of Houdini’s most famous stunts. 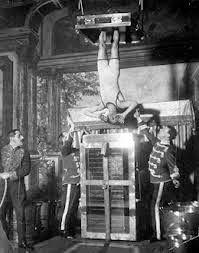 In that escape, Houdini’s hands and feet were bound while he was lowered, upside down, into a glass tank filled with water. The tour seemed plagued by bad luck from the beginning. The first bad luck was when Bess contracted food poisoning. Houdini stayed awake all night by her side. By the time they reached the next town, Houdini had gone three nights in a row without sleep. Then, during another show, he broke his ankle during the Chinese water torture escape. Houdini was used to working with injuries and completed the show, but the pain from his ankle was excruciating, and he was awake all night. Even so, the show must go on, and the tour proceeded. Houdini stuck to his schedule, which included giving a lecture at McGill University. The next day, several students from the lecture were chatting with Houdini in his dressing room. One of the students, an amateur boxer, asked if it was true that Houdini could withstand any blow to his body above the waist. Houdini admitted that it was true and, despite his weakened condition, gave the student permission to test him. As Houdini began to rise from the couch where he was sitting, the student dealt him several sharp punches in the stomach before he had time to tighten his abdomen. The blows caused Houdini a great deal of pain, which persisted until his show that afternoon. The next day, he was no better. By then, he was also suffering from chills and sweating. Houdini performed two shows, and the company moved on to Detroit, Michigan. Still in pain and feeling worse all the time, Houdini finally saw a doctor, who urged him to go immediately to the hospital, but he refused. Only after completing the show did Houdini finally agree to go to the hospital. He was in bad shape. When the doctors operated on him, they found that his appendix had burst, causing peritonitis, a usually fatal disease in the age before antibiotics. Houdini was given little hope of surviving even after a second operation. Realizing he was near death, Houdini shared a secret message with Bess to be used as proof of his identity in the event that he was able to communicate with her from beyond the grave. Harry Houdini died on Halloween, 1926. Despite annual séances on the anniversary of his death, Bess was never able to contact him. She died in 1943. Without question, Houdini was one of the greatest magicians and showmen in history. He continues to fascinate magic aficionados. His famous tricks have been done over and over by many of the talented magicians that followed. Some of the tricks have been updated and modernized over time, but by their death defying nature alone, they are still very much identifiable as belonging to Houdini. The great magicians who have kept Houdini’s spirit alive by continuing to bring these illusions and tricks to new audiences do so not to outdo Houdini but to honor his great mastery of the craft. Brother Harry Houdini became a Mason in St. Cecile Lodge No. 568, New York, New York, in 1923. He received his Entered Apprentice Degrees on July 17 and his Fellow Craft Degree on July 31. He was raised a Master Mason on August 21, 1923. He became a life member on October 30, 1923. He was also a member of the Shrine Temple. ~Excerpt from Todd E. Creason's award winning book Famous American Freemasons Volume II.